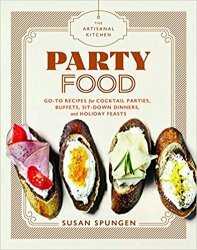 Party Food is the newest addition to the Artisanal Kitchen series, adapted from What’s a Hostess to Do? (Artisan, 2013) by the ultimate hostess, Susan Spungen. Here is a collection of recipes that makes entertaining easy for any occasion—whether it’s a cocktail hour, a brunch, a dinner party, or an elaborate holiday feast. Recipes for Lobster Salad, Tarragon Roasted Chicken, Potato Gratin, and Chocolate Souffl? make for an easy-to-make foolproof dinner menu that even complete novices can master; cheat sheets like Ten Quick Hors d’Oeuvres and Five Entr?e Salads make entertaining a crowd cheaper and easier than ever; and recipes for high-stakes holiday meals like Roasted Fillet of Beef or Roasted Turkey Parts elevate the classic crowd-pleasers to dishes that guests will rave about for months.